After 12 years of competitive dancing, senior Lauren Trumble of Ithaca, New York, chose UVM to pursue a collegiate running career on the track and field team. 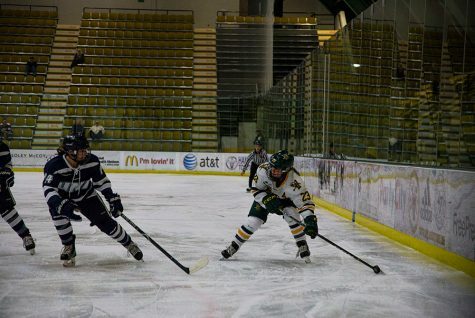 Trumble later rose to track captain and broke the America East Championship record in February 2019, according to UVM athletics. She also earned most outstanding performer with a personal best in the 1,000 meter run this season, according to UVM athletics. With about one month left in her career as a middle-distance runner, she said she would like to break a few more records. She began her running career after she decided to stop dancing during middle school, Trumble said. Head coach Matt Belfield said he feels fortunate that Trumble is on the team. “She’s one of the best and we’re grateful for her in our middle-distance program,” Belfield said. In the program, runners train together in small groups with others who compete at the same distance. Trumble’s success in middle -distance running is part of a greater picture of the team’s history, Belfield said. “Our team has a strong middistance program, while southern schools tend to be more focused on sprinting,” he said. Fellow middle-distance runner Caroline O’Shea, a sophomore, admires both Trumble’s running and leadership. As a biology major, Trumble wants to be a physician and doesn’t want to pursue a professional running career, she said. The track and field team will have their only home meet, the Catamount Heptathlon, April 13 and 14.